Georgia Nut Company, a family-owned business that churns out 90 million pounds of product a year is one of the largest privately held confection and snacks manufacturers in North America. As a contract manufacturer for some of the biggest brands in the industry, Georgia Nut Company’s expertise began in 1945 when Rose Musso started roasting and selling the highest-quality nuts to family and friends. Four generations later and the company has diversified to include complimentary offerings that comprise of various chocolates and confections. Georgia Nut Company operates out of two state-of-the-art facilities: a 130,000 square foot manufacturing facility in Skokie, Illinois and a 180,000 square foot packaging and distribution center about a mile away, in Niles, Illinois. Georgia Nut Company’s commitment to excellence is apparent by the fact that they are constantly reinvesting back into their business. These investments include capital equipment expenditures that allow them to increase their productivity while continuing to produce safe, high-quality products for their customers. For example, Georgia Nut Company is in the process of transitioning away from using traditional bucket elevator conveyors for transferring and feeding their confectionary and snack products to scales and baggers. “The bucket elevator conveyors can require a lot of maintenance,” Georgia Nut Company Process Engineer Lucas McCallister said. “They are finicky and need to be watched over the course of each run. There is always a concern that a bucket scoop could jam, crack and fall off.” When that happens, they have to take apart the whole thing and bring over the quality inspector to make sure there aren’t broken pieces in the product stream. 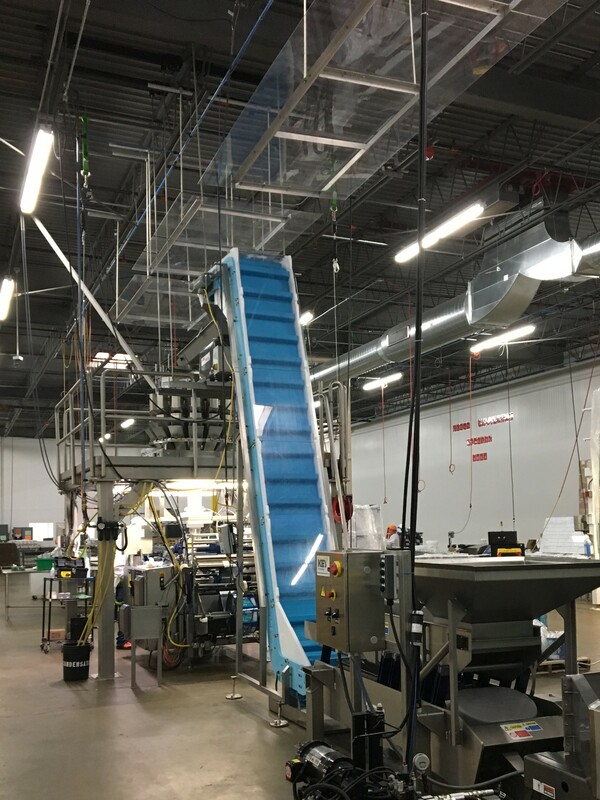 In 2014 Georgia Nut Company discovered DynaClean conveyor systems manufactured by Dynamic Conveyor Corporation of Norton Shores, Michigan. “We approached Dynamic Conveyor because of the simplicity of changeovers. We liked that we can break the conveyors into smaller sections so we can clean them easier,” McCallister said. Georgia Nut Company’s first purchase was a 14’ tall Z style incline conveyor that replaced a bucket elevator for conveying chocolate panned confectionaries including peanut clusters, coated pretzels and malted milk balls. 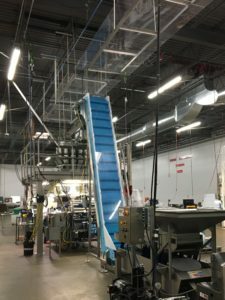 Unlike the bucket elevators, Georgia Nut Company is able to run their DynaClean conveyors for the entire product run, which is typically 3 shifts for up to two or three days. “In the past we had to stop and clean the bucket elevator before a product changeover. We couldn’t see the issues on the bucket elevators because they were 10 feet off the ground. With the incline conveyors we have very good visibility of the whole conveyor and what’s going on,” explained McCallister. “Dynamic Conveyor works with us on whatever applications we have and none of them have been the same. They have jumped through hoops to design and build the conveyors to meet our demands,” said McCallister. Dynamic Conveyor is able to build their custom conveyor systems by utilizing the same basic design principles and components. 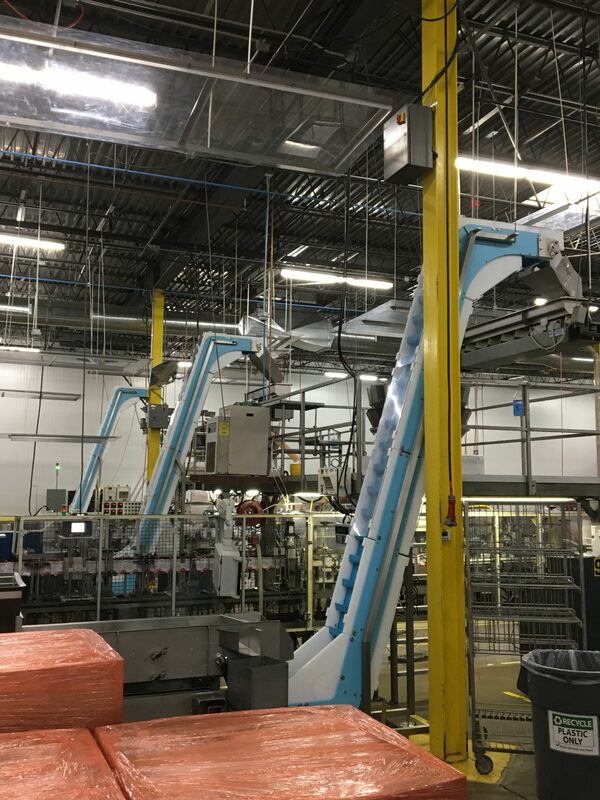 The end result is a conveyor system that is unique for each application, but includes the familiarity of using components that are the same or similar. “It really helps our maintenance department. Even though they are custom conveyors, the parts are very similar so we are able to work on the conveyors easily. Even if the conveyors are different and more customized, we still know how to work on them,” McCallister said. The same holds true for cleaning and sanitation. Georgia Nut Company breaks down the conveyors by removing the side rails, belting and belt supports and placing them on racks for cleaning in their washing machine. “It goes back to being very simple. It’s very simple for the operators to take apart, to clean and put back together. Any shift can change, wash and put the DynaCleans back together. They are very user friendly,” Lucas McCallister said. Since installing their first DynaClean conveyor system, Georgia Nut Company has found great success by replacing several of their bucket elevators with DynaClean conveyors. “We used a variety of different bucket elevators – and we still have a few – but we are trying to replace them with DynaCleans,” said McCallister.